Ahi tuna -- an alternate name for yellowfin tuna -- is often used in raw fish dishes in Asian cuisines, and it's also one of the most common types of tuna used for canning. While it serves as a great source of several nutrients you need for good health, it's also slightly higher in mercury than other types of tuna. The Hawaii State Department of Health recommends limiting your servings to twice per month. Ahi tuna comes loaded with protein. Each 6-ounce serving of tuna offers an impressive 41.5 grams of protein -- 90 percent of the daily protein needs for women and 74 percent for men, according to the U.S. Department of Agriculture. Your body digests the protein in tuna to give rise to individual amino acids, and then uses them to make proteins needed for tissue strength, as well as hormones and enzymes that govern cell function. The selenium in tuna helps activate several of these enzymes, and getting enough selenium in your diet controls new cell growth, maintains proper blood vessel function and plays an important role in sperm production. A 6-ounce portion of ahi tuna contains 154 micrograms of selenium, which is almost three times your daily intake requirements, set by the Institute of Medicine, or IOM. Eat ahi tuna and you'll also boost your intake of bone-friendly nutrients, including vitamin D and phosphorus. Your body uses phosphorus -- along with other minerals, including calcium -- to make new bone tissue. The vitamin D in ahi tuna helps your body use calcium properly, which also supports bone tissue growth. As a result, getting enough phosphorus and vitamin D in your diet helps keep your bones dense, strong and resistant to fracture. A 6-ounce portion of ahi tuna contains 473 milligrams of phosphorus -- roughly two-thirds of your recommended daily phosphorus intake -- along with 117 international units of vitamin D, or one-fifth of your recommended daily intake. 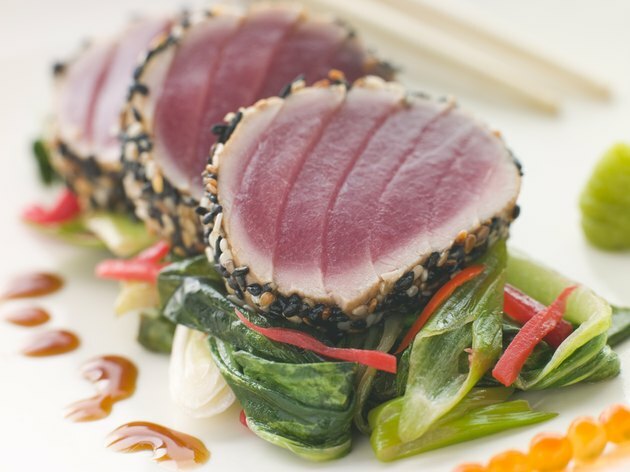 The potassium and vitamin B-12 abundant in ahi tuna support nerve and brain function. Vitamin B-12 helps you make neurotransmitters, the chemicals your cells use to communicate, as well as myelin, a substance that helps your nerve cells conduct electricity. As an electrolyte, potassium also aids in nerve communication because it helps your nerves conduct electricity. A serving of ahi tuna provides you with 3.5 micrograms of vitamin B-12 -- more than the 2.4 micrograms you need daily -- as well as 750 milligrams of potassium, which contributes 16 percent toward your recommended daily intake. Ahi tuna's relatively high mercury content can pose a health risk, causing symptoms that can include insomnia, difficulty concentrating, nausea, vomitting and pain in your mouth, according to the Department of Pediatrics at NYU Langone Medical Center. It's especially harmful for young children and pregnant women. While ahi tuna also provides some beneficial omega-3 fatty acids, other varieties of tuna offer more. For example, a 6-ounce portion of ahi tuna contains just 0.2 gram of omega-3 fatty acids, while an equivalent portion of canned albacore tuna contains 1.5 grams. These omega-3 fatty acids lower several risk factors for heart disease, so opting for ahi tuna over albacore means you're missing out on some cardiovascular benefits.